Honest History has been interested in the bombing of Darwin almost since we began the website, though our interest has extended to aspects that are not likely to be front and centre this week during the 75th anniversary events. Obviously, any deaths in war are a tragedy and the deaths of approximately 240 people in Darwin and the wounding of another 300 to 400 (plus others at Broome and elsewhere) need to be remembered. Yet there are other elements to what Australia has done with Darwin that go to appropriateness, proportion, and context and they are what this note addresses. Some of the material has appeared on the Honest History site previously. The falling of bombs on the Australian mainland will destroy whatever shred of complacency lingered in this country. It will cause no dismay and raise no doubts. If it underlines the very real peril in which the whole of Australia now stands, that will but steel the resolution of the people to defend their homeland with every title [sic] of their strength and skill. Australia’s peaceful possession of her island continent, never hitherto questioned, has now been challenged, and the answer will not be wanting. The bombing of Darwin is a call to every man and woman to stand fast, to put aside all facile hopes and false illusions, and by service to the nation in one form or another to help defend its title to the White Australia which is the product of a century and a half of hard pioneering. That title, won by sweat and privation, can be confirmed only in sweat and blood, but in this harsh task of their nationhood Australians will neither flinch nor fail. 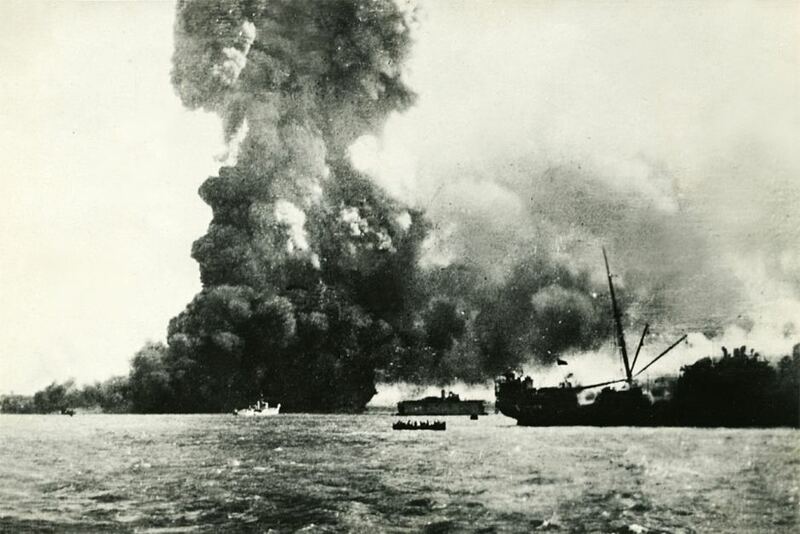 The Darwin bombing was a tiny part of World War II and a small part even of Australia’s war (except in that it touched our shores). Yet we – or those of us in the Northern Territory or those wanting to be popular up that way – have made an awful lot of it. In 2013, we referred to Darwin academic Alan Powell’s analysis of the growth of bombing-related tourism over the years, culminating in Prime Minister Gillard being persuaded in 2011 to designate a national day to mark the bombing. Powell looked at the commemoration at decade intervals from 1942, noting that nothing much happened before NT self-government in 1978. By 1982, though, there was an elaborate ceremony focusing on the heroism of locals in 1942. (Not so much on the post-bombing shemozzle.) In 2002, 60 years on, the NT government helped 800 veterans to travel to Darwin for the commemoration, with considerable benefits to local business. By 2012, the government had put $10 million into the Defence of Darwin Experience (see below), 40 commemorative events, including a black-tie ball, a commemorative AFL match, and ‘A minute’s warning: a one-off wearable art production showcasing creations inspired by the bombing of Darwin’. ‘Apart from the five commemorative ceremonies [in 2012]’, Powell concluded, ‘nearly all of the planned events were principally concerned with tourism, commercial opportunity and/or politics’. We recently posted Darwin schoolteacher John Shield’s whimsical take on how his town does commemoration. He described various examples, from a book about a Spitfire-flying mouse, to re-enactments, to saturation TV advertising weeks in advance of the actual date of the 75th anniversary. Shield was impressed by the Defence of Darwin Experience but alarmed at a virtual reality version of the bombing. We noted also the enthusiasm of then NT Chief Minister Giles about Darwin 1942. 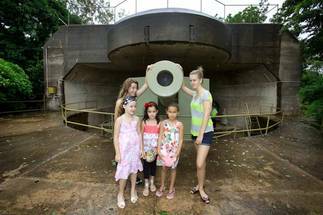 ‘The Territory’s World War II heritage is one of its greatest tourism assets’, Mr Giles said in April 2015. One of his media releases referred to ‘the deaths of thousands of people’ in the Japanese raids on Northern Australia, when the total figure was under 400. 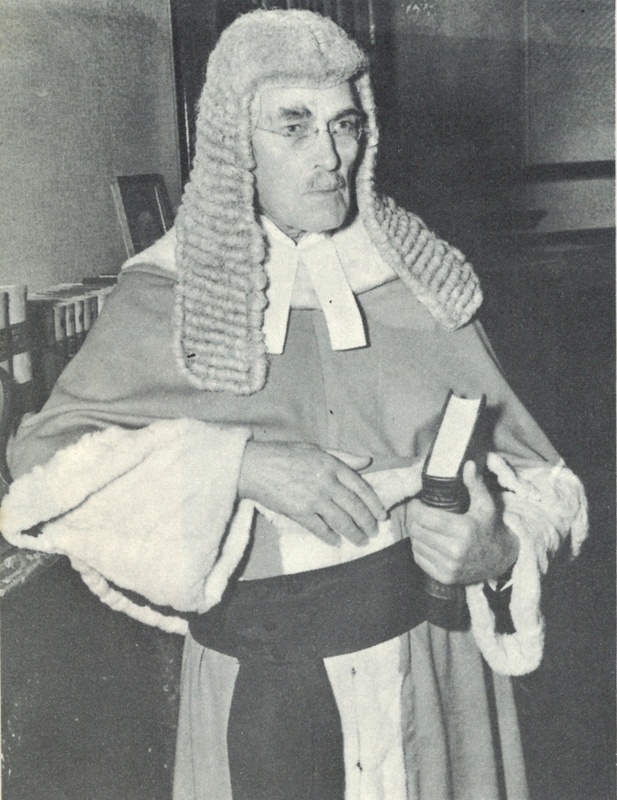 Mr Giles’ counting skills or lack of them may have contributed to his losing government – and his seat – not long after. Meanwhile, the media releases from Mr Giles’ successor, Labor’s Michael Gunner, this week included something about National Condom Day (14 February) but nothing (so far) about commemoration of bombing . Update 17 February 2017: Gun ‘storian, Peter FitzSimons, has been taken on by the NT Government to raise the profile of the Darwin bombing. Our comment on this development. Update 19 February 2017: more from the NT News including a 56 page supplement. PM’s remarks; media release. · 235 lives lost, a further 400 injured. We know now that these attacks, and the 100 or so more that would follow across the top end over the next two years, were not a precursor to an immediate full scale invasion. Rather, their objective was to disrupt Darwin’s capabilities as a base to support the wider conflict to the north and at the same time damage the morale of the Australian population. But the attacks focussed our attention to our neighbourhood and our security. Because—with the bombing of Darwin and the fall of Singapore just four days earlier—we knew that our part of the world, our sovereignty was at stake. The time had come to put our interests and our security above all else above all else. And this is what we did. Nagasaki: 35-40 000 civilians killed, 9 August 1945. Events can be any of the following [says the website] (subject to terms and conditions): commemorate the 75th Anniversary of the Bombing of Darwin; build awareness and promote the Territory’s significant military and wartime history; increase awareness of the Northern Territory’s involvement in WWII. There are historical resources, educational materials, commemorative number plates, a visual arts project, the Territory Remembers brand, and postcards. Local media companies provide sponsorship. Separately, there is the Defence of Darwin Experience, ‘the first facility in Australia to provide you, the visitor, with an immersive, interactive, multimedia experience which extends beyond the physical walls of the precinct “hub”‘. Opened five years ago, this exhibition is run by the Northern Territory Government and the Darwin Military Museum, and supported by the Department of Veterans’ Affairs and Engineers Australia. It is strong on activities for children, as the picture above (with original caption) shows. Meanwhile, the American Alliance, which was just getting under way in 1942, is exemplified today by the presence of US Marines at Robertson Barracks, near Darwin. 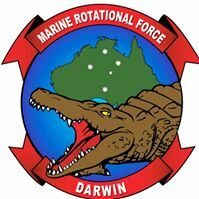 The ‘rotational force’ has its own (not recently updated) Facebook page and appropriate mascot-logo (below). If there is another attack on Darwin at some point in the future, the help will be right on the spot. Perhaps. This week was also the 75th anniversary of the sinking of the SS Vyner Brooke and the massacre of British soldiers and Australian nurses by Japanese soldiers at Banka Island. Sister Vivien Bullwinkel was the only survivor. Minister Tehan’s media release provides details of this commemoration.